Army of Robots is an Apple AR arcade-style mech shooter in which you must destroy robots that are invading your real world. Those robots came with one attention, to eliminate all humans and take control over our planet. You are the only one who can stop them. An AR game where the real world turns into a huge battlefield. I am a huge first-person shooter fan and therefore I was eager to see what ideas developers have up their sleeves for this genre. Singergia Studios has just released a new Augmented Reality game for iOS called Army of Robots. For some reason, many of the upcoming games have "AR" in them, although I don't think this one was done intentionally. Anyways, let's check out what this mobile AR game is all about. 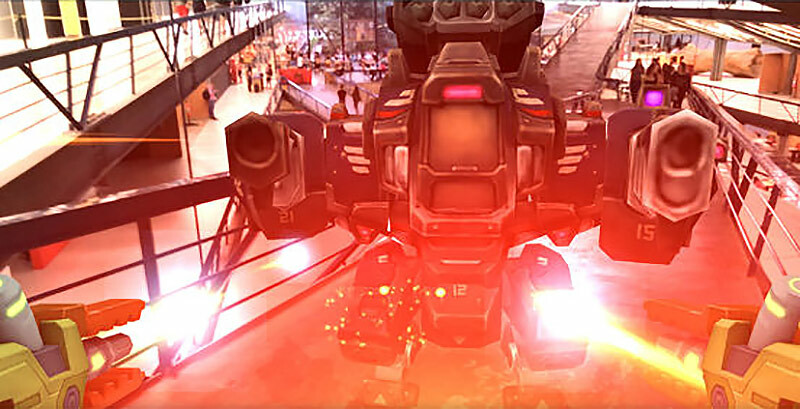 Army of Robots is a first-person mech action shooter AR game. In this game, robots have invaded our planet Earth and plan to destroy all humans and take control over it. It's up to you to take control back and eliminate those robots from our world. The game brings arcade-style gameplay on a large scale. It turns the real world around you into a huge battlefield. Robots can spawn all around you and it's up to you to use your mech to shoot them down. It's a wave-based game where you need to clear out stages and move on to the next one. After each level, you get to see the total score you've got based on your achievements. The gameplay mechanic is very simple and straightforward, aim at the robots using your iPhone or iPad and tap the screen to start shooting. I highly recommend checking out the gameplay trailer videos to see what this game is all about. It was so cool seeing those people in the video enjoying the sun and relaxing while this guy is shooting deadly robots all over the place. This is one reason why AR is much easier to sell than VR. At that moment I just felt that I want to grab the game and start shooting robots in my neighbor's backyard, in the supermarket or in the gym. It doesn't matter where you are, you'll find those type of engagements anywhere! By the way, after seeing this gameplay video, I do wish there was an option for the robots to detect humans in the scene. This way, the robots could actually hit the virtual representation of the real people in the scene and it's up to you to annihilate them before they cause them any damage. Once you do that you could get additional bonus score. I can think about many cool ideas that I can add to this game that will make it even better. The interaction with the environment is something that I think we will probably get to see in the future as ARKit continues to evolve. As for right now, it's just all about positioning the 3D models on physical planes and adding interactivity. By the way, those robots aren't passive. They will try to attack you back and take you down using their rockets. You can also shoot down those rockets or evade them by repositioning yourself. Some of the robots are small others are much larger in scale; some are on the ground, others in the air. You need to reposition and rotate your iPhone or iPad to get the right angle on the target every time. The graphics are nice. The mech models are very detailed and I really liked the option where you can shoot certain body parts down. rather than having a single target to shoot at with nobody destruction system at all. For example, you can shoot at the robot's arm, the one with the equipped rocket launcher, and take it down so it can't shoot you anymore. 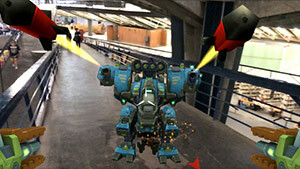 Army of Robots is among the first FPS games for Apple's Augmented Reality platform. If you ever wondered how a first-person shooter plays on AR, you should certainly get this title and try it out. The game is aimed towards FPS fans and those who like fast-paced arcade-style action games. The game is designed for both iPhone and iPad alike, but it requires iOS 11 or later and is compatible only with ARKit supported devices (iPhone SE, / 6S / 6S Plus / 7 / 7 Plus / 8 / 8 Plus / iPhone X and iPad Pro (all 3 versions), iPad 9.7" 2017 models. For more information visit the official game's page on the App store or iTunes. I highly recommend checking this game out. One of my favorite AR desires was to be able to fight enemies in my own sorrounding environment, and Army of Robots has just made this come true. There are 12 stages waiting for? Get out there and show those robots who owns this planet!